You need to lose consciousness or memory to be diagnosed with concussion. A normal brain scan means you’re cleared to play. You’re OK to play once the headache has gone. a second concussion in the same season (Guskiewicz et al, 2000). There is currently no known cure for concussion but the passage of time. All symptoms must have cleared. You should have a normal neurological examination. Here are some of the most common opinion statements and some simple evidence-based responses to bust the myths in what is a complex and often emotive topic. Neem jou kind aan kontaksport deel, is harsingskudding maar altyd in ’n mens se agterkop. Maar latere probleme kan voorkom word. Rooi Rose Magazine, June 2014, Page 84. 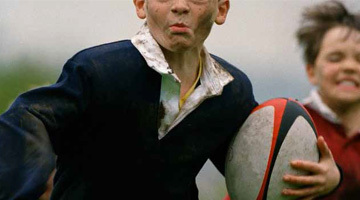 Figures from SA Rugby indicate that 12-15 percent of boys playing rugby in any given season will be concussed and that there is a 50 percent chance of a player receiving a blow to the head, resulting in concussion, at some time in his school rugby career. A study presented at the American College of Sports Medicine annual meeting by Kevin Guskiewicz and others and about to be published in Med Sci Sports Exerc claims that the risk of depression later in life is three times higher in those American football players who have suffered three or more concussive episodes in their career.. Recently retired Lions doctor Jon Patricios to advance the drive to make the management and treatment of concussion in rugby more scientific and efficient through the Pharos Concussion Programme. A concussion is an injury to the head caused by a direct or indirect blow to the head. It is defined as a complex pathophysiological process affecting the brain, induced by traumatic biomechanical forces.